Still undecided about what to make as your main course this Easter? 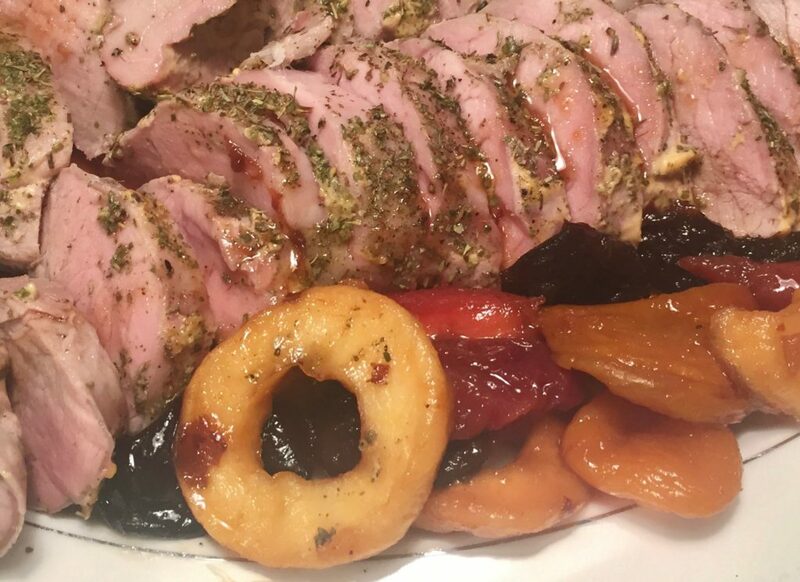 For us, it’s typically lamb, or sometimes ham, but if you want to try something different, yet festive, easy and delicious, then give this recipe a go. 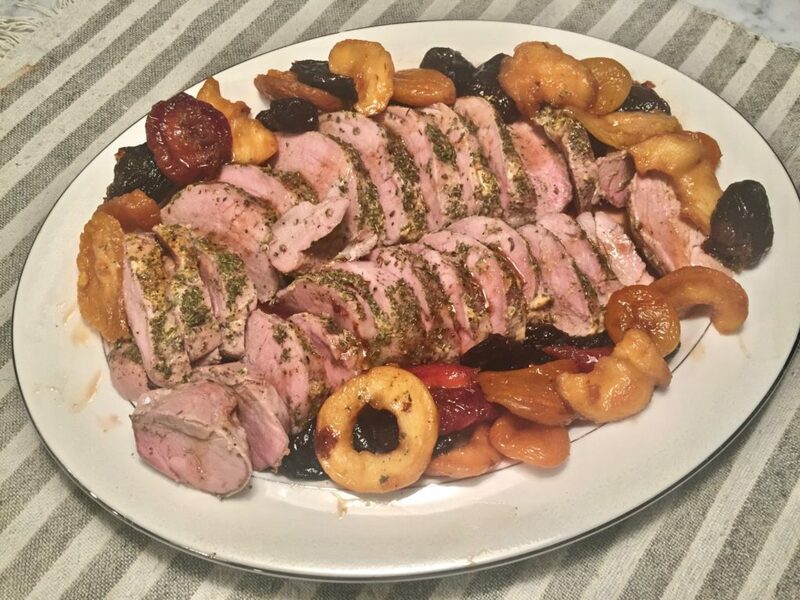 Roast pork and fruit are a delicious pairing and perfect for any holiday or special occasion. It won’t keep you from your guests for long, since it can be prepared ahead of time and takes only a half hour to cook. You can roast the meat while you’re sitting down to pre-dinner drinks with friends and family. Stew the fruit the night before to save time, but even this takes only 15 minutes. 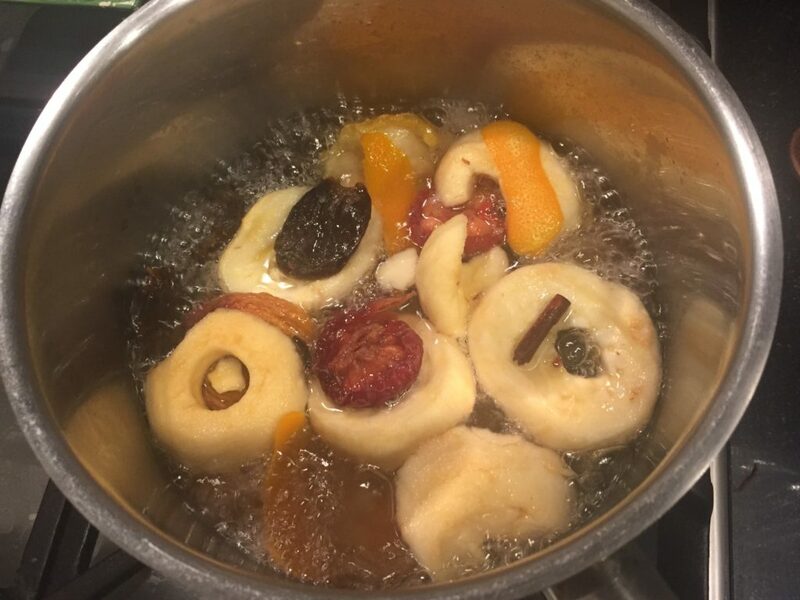 I bought an assortment of dried fruits – peaches, apples, pears, prunes and apricots, plus some orange and lemon peel – and covered them with boiling water, a bit of sugar and a cinnamon stick and whole cloves. The fruit can sit in the fridge overnight, and you can reheat it at the last minute, while the meat is resting. After you slice the meat, arrange the fruit around the sides, and pour both the meat juices left in the roasting pan, and the fruit juices all over the meat. 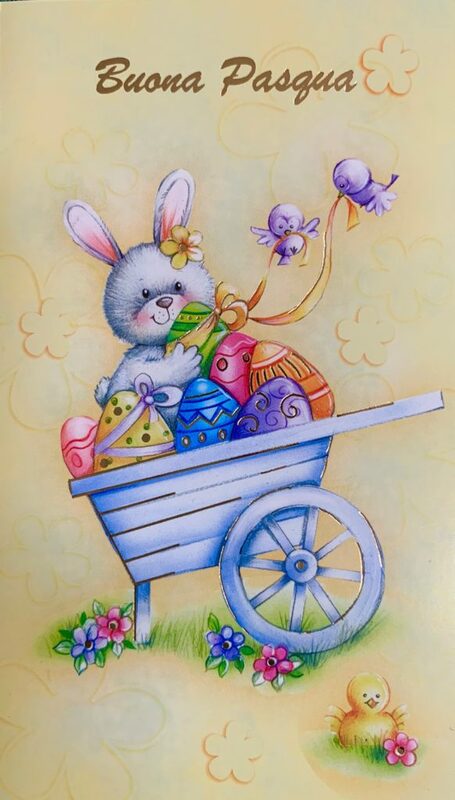 Buon appetito e Buona Pasqua a tutti. Bring the meat at room temperature and dry with paper towels. Smear a little olive oil on the bottom of a roasting pan. Place the meat on the pan and smear with a light coating of Dijon mustard. Season with salt and pepper (or herbed salt) and a light sprinkling of herbs de Provence. Remove from the oven and let the meat rest for 10 minute, then slice. Place the fruit in a saucepan with water to cover. Add the sugar, the citrus peels, the cinnamon and the cloves. Bring to a boil, then lower to a simmer and cook for about 15 minutes or until fruit is softened. Remove the citrus peels, the cinnamon stick and the cloves. Remove from the heat, and serve along the sides of a serving platter with the sliced meat. Pour the juice from the fruits and any juice from the meat (on the carving board) over the sliced meat. I’ve made dozens and dozens of gingerbread cookies, and baked and decorated many gingerbread houses when my kids were little, but a gingerbread cake? 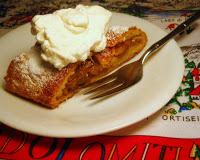 Well, I’d never made one, and if truth be told, had never eaten a slice of one until a few years ago. It wasn’t a flavor that I’d grown up with or ever had the yen to seek out on my own. But I have to say, I was a convert after tasting that first slice of gingerbread cake a few years ago at the house of friends. Those same friends who served the gingerbread cake – Jan and Dave – also send us a box of Harry & David pears each Christmas. 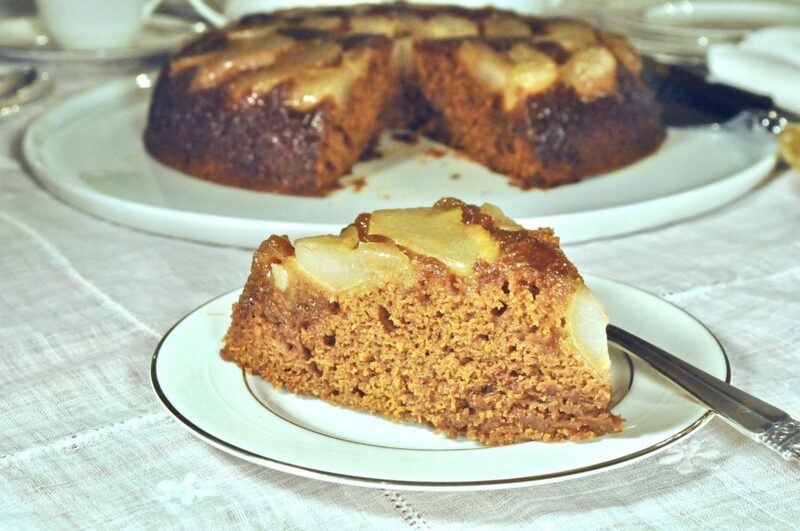 Last year, I made an upside down pear walnut cake with some of them last year here. We loved the nuttiness of this cake, but I wanted to try something different this year. Eureka! 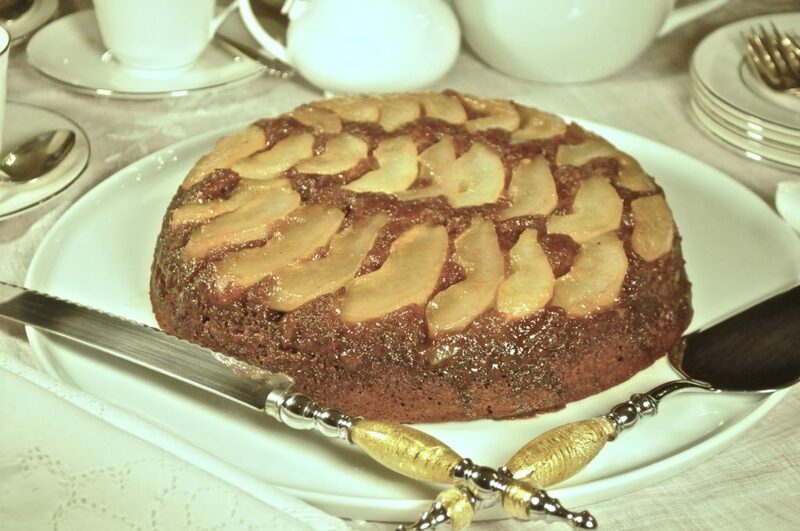 I found a cake recipe combining gingerbread with pears in an upside down cake crowned with a luscious caramel-y top. 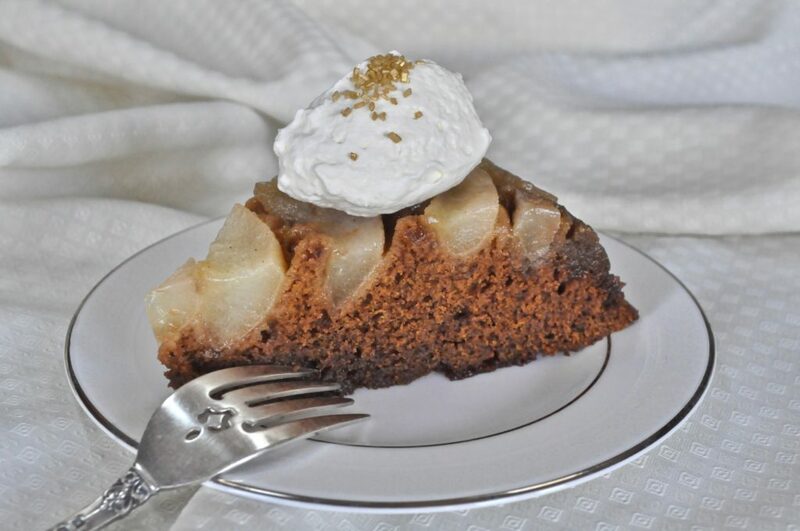 It turns out pears and gingerbread were made to party together! 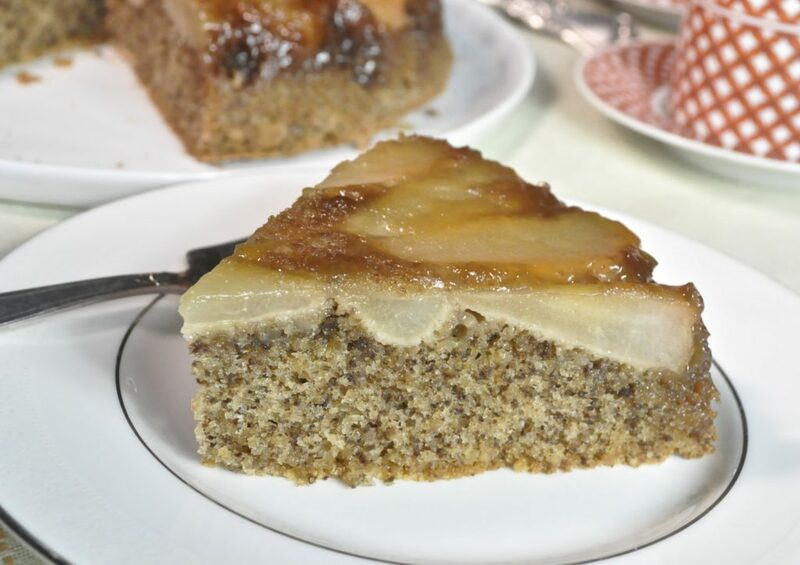 Although I’ve made many upside down cakes, with fruits of all kinds, most of them (not the walnut cake) have a basic white or yellow cake batter as the base. Like the walnut cake though, this gingerbread cake recipe is a welcome change from the standard upside down cake batter. 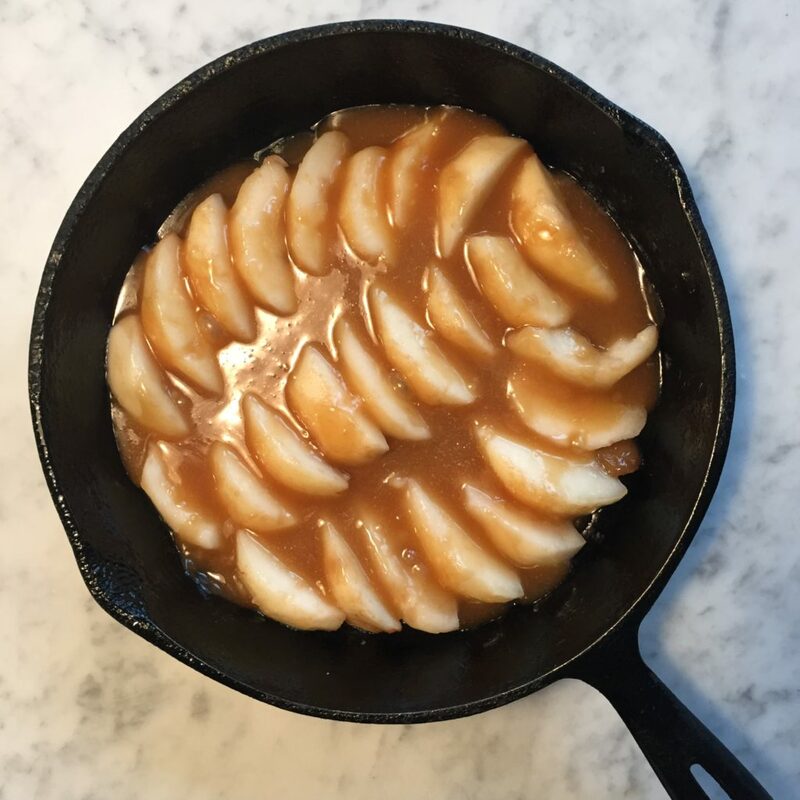 Lay the pear slices in a cast iron skillet (or a 9″ cake pan) and pour the brown sugar/butter mixture on top. 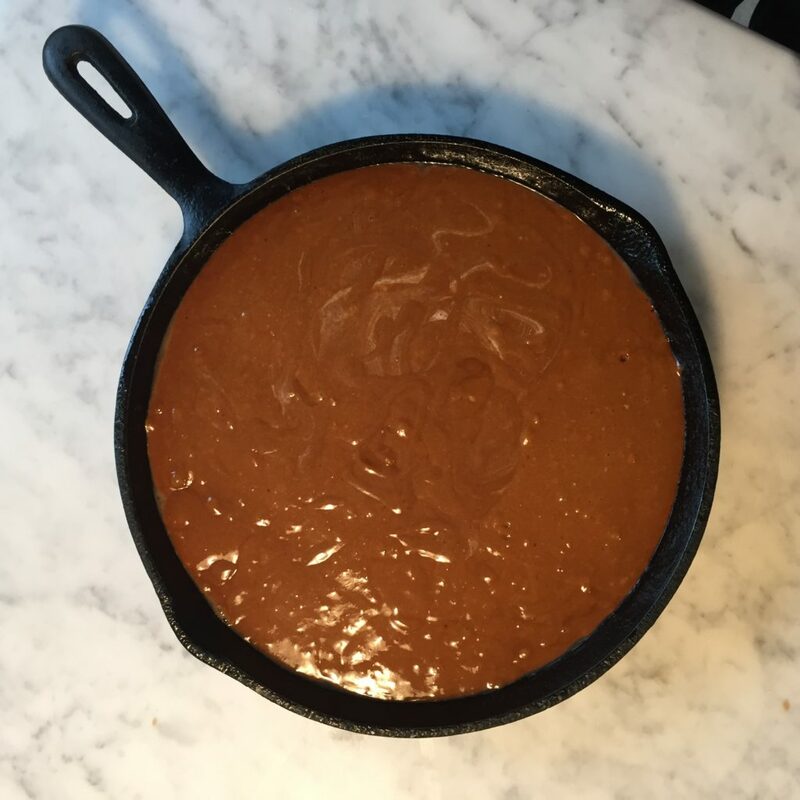 Then make the batter, which is very dark since it contains molasses and many spices. It comes out of the oven looking like this. 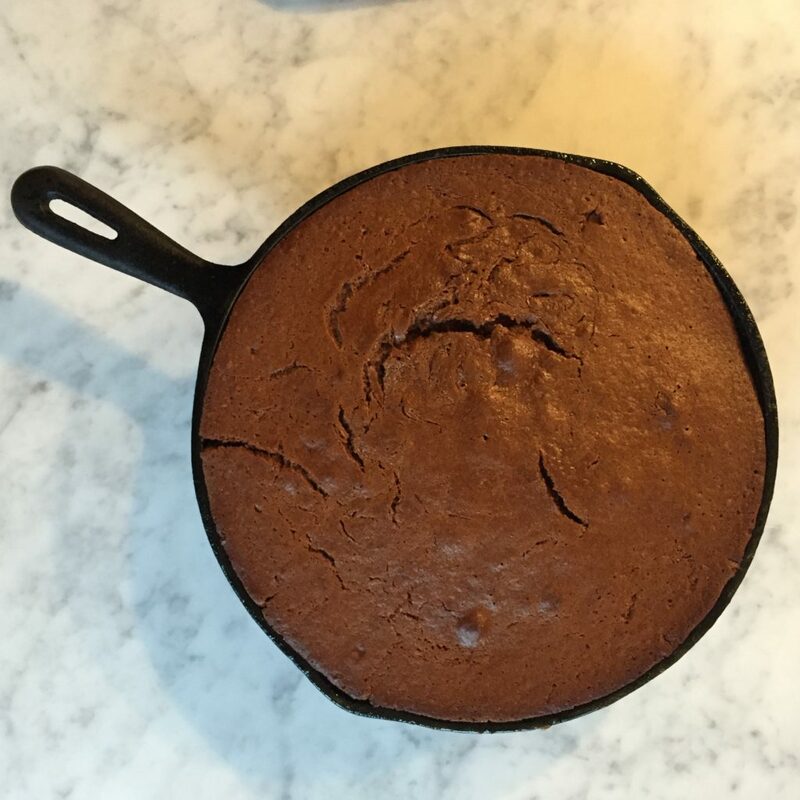 Run a butterknife around the edge, then using two pot holders, place a large platter (a wider diameter than the pan) over the cake and flip it over. Careful, don’t burn yourself on the pan or the hot syrup. Top it with whipped cream or ice cream. Of course, the topping is not strictly necessary, but the coolness of the cream with the spiciness of the cake is divine. Besides, what are a few more calories when bathing suit weather is still months away? This cake is best eaten warm from the oven, but it tastes delicious the next day too. 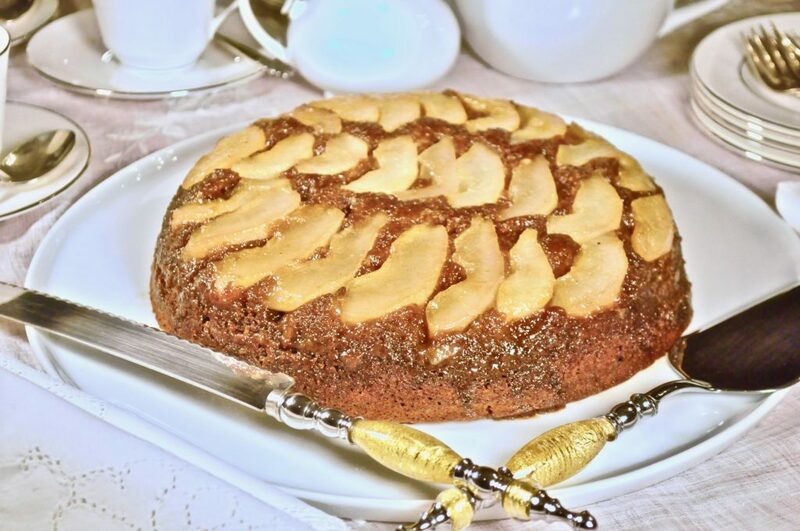 Unlike most white or yellow upside down cakes, whose texture get denser the next day, this gingerbread cake maintains its tender crumb and moist texture even a few days after baking. 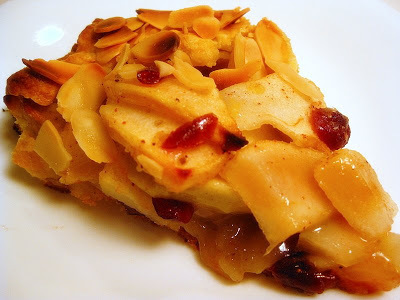 The pears and the brown sugar topping do soften somewhat if you don’t eat it all the day it’s baked, however. It serves at least eight people, so plan on taking some to a neighbor as I did, or invite some friends in for coffee and cake. Prepare the topping: Lightly grease a 9" square or round baking pan (I used a cast iron skillet). Peel, core and slice pears into thick slices. Tightly layer the pears in the prepared pan. Set aside. Whisking constantly, heat the butter, brown sugar and cinnamon together in a small saucepan over medium heat. Once butter has melted, vigorously whisk to ensure the butter is not separating from the brown sugar. Once it comes together, pour evenly over pears. Whisk the flour, baking soda, ginger, cinnamon, cloves and slat together. Whisk the molasses and hot water together. Set aside. Beat the butter and brown sugar together on high speed until smooth and creamy, about 1 minute. Scrape down the sides and up the bottom of the bowl with a rubber spatula as needed. Beat in the egg and vanilla extract on high speed until combined, about 1 minute. Scrape down the sides and up the bottom of the bowl as needed. Turn the mixer off and add the dry ingredients and molasses/water. Turn the mixer on low and mix just until combined. The batter will be a little thick. Carefully pour/spread batter on top of pears. Bake for around 35-45 minutes or until the cake is baked through (I put a cookie sheet lined with aluminum foil on the rack below the cake to catch any butter/brown sugar that might spill out). To test for doneness, insert a toothpick into the center of the cake. If you notice the edges or top browning too quickly, tent the cake with aluminum foil.